I am an avid routine keeper, somedays are harder than others especially as a work from home individual! But my day always includes one hour with God, either before I ‘go’ to work or after work and lunch of course. Adding Shauna Nieguist’s Savor book of devotions/journaling prompts has been a nice reminder to enjoy each day for myself and the blessings no matter how small. Shauna has really encouraged me as a home cook and a fellow sister in Christ. Also her recipes are *amazing* to say the least! 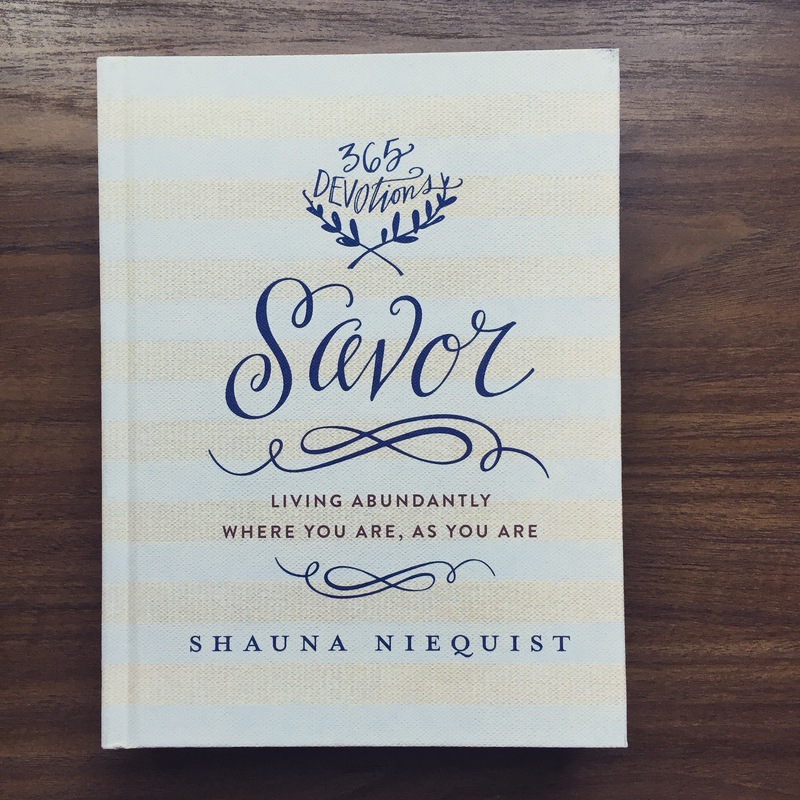 Her new book, Savor is 365 days of devotions for living abundantly where you are, as you are. Each day there is a short reading, a verse and a question to challenge your faith and help you savor the day ahead or behind. I listened to a podcast with Shauna explaining the process and her hesitation on this project and I think because of that interview I appreciate this book a bit more. I admit I did not read this entire book before posting my review…I do want to savor this book throughout the year…so I read portions. Like my birthday, my husband’s birthday, our anniversary and other important dates through out the year. This book is not a theologically challenging devotional, it is more of a reminder to love and live each day for God and with God. I read it more as a journaling prompt devotional, if that makes any sense. Savor has a wonderful quality about it. Almost heirloom like, the pages are heavy and and trimmed in blue, it has a satin ribbon to mark your place and the script is beautiful. This is a book to enjoy, and it looks gorgeous on your side table. Do you journal each day? How do you Savor each moment? I love books like this that push you to question and answer your day. It sounds like a pretty book as well. I might have to look into this! I love Shauna!! I loved Bread & Wine and read it last summer. This might be a great devotion for me because I already love the way she writes! Thank you for sharing! I apologize if you get a double comment from me. I’m not sure what happened! I love your post and think devotions are such a great idea. I have been wanting to buy a devotional book for a while now. I think it’s so important to savor the moments and take everything in! Life moves too fast! The book is BEAUTIFUL! What a great idea! I am loving this book! Simple sweet and perfect for each day!